By now, all of us herpetologists have heard quite enough 'Snakes on a Plane' jokes, thank you very much (they're second only to jokes about how we probably study STDs - never heard that one before). Meanwhile, in reality, snakes have been flying - well, gliding, really - since long before Samuel L. Jackson had had it with them. True flight, actively wing-powered and sustained for lengthy periods of time, has evolved only four times (in insects, pterosaurs, birds, and bats). In contrast, gliding flight (defined as falling at an angle more shallow than 45° from horizontal) is more energy efficient and has evolved many times, and many birds use both gliding flight and true flight depending on the circumstance. Among the vertebrates are found gliding lemurs, squirrels, fishes, frogs, lizards, ants, squids, and of course snakes. Of all the groups that have evolved gliding, snakes would seem to be the least likely candidates, because of their long, cylindrical body that seems ill-suited for flight. But evolve to glide they have. Many gliding groups live in the rainforests of Asia, especially on the island of Borneo, where the trees are very tall and widely spaced, and southeast Asia is where you will find the five species of gliding snake, genus Chrysopelea. Jake Socha, a comparative biomechanics researcher at Virginia Tech, studies the gliding flight of Chrysopelea. For his PhD at the University of Chicago, he characterized their mechanism of takeoff, the postures they adopt while gliding, and contributed substantially to our knowledge of their morphology. Socha and colleagues used multiple synchronized video cameras to film and digitally reconstruct the trajectory, speed, and body posture of gliding Chrysopelea, which they frightened off a three-story scaffolding built with a branch sticking out of the side, to simulate a tree. The videos showed that the snakes could descend at a very shallow angle of 13°, comparable to flying squirrels and other accomplished gliding vertebrates. Next, Socha and colleagues looked for relationships between measures of the snakes' flight performance, such as glide angle and horizontal speed, and morphological characteristics of the snakes. They found that smaller snakes were better able to glide long distances than larger ones, and that the wave amplitude of the snake's body was a more important predictor of flight behavior than its wave frequency, the latter of which they hypothesize helps maintain stability during flight. 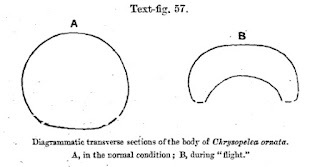 In order to transform their bodies from fairly non-aerodynamic cylinders into a more aerodynamic wing-like shape that generates lift, Chrysopelea can flatten their body by extending their ribs, an observation first made by Robert Shelford (also the first person to document their gliding behavior, in 1906). The flattening process proceeds from anterior to posterior, does not include the tail, and takes only 100–350 milliseconds to complete. Although the exact mechanism of rib expansion has not been examined, it is presumably similar to that used by cobras to spread their hoods. Because the rib muscles are also involved in breathing, it is likely that Chrysopelea cannot breathe when gliding, which could physiologically limit the duration of their glides. 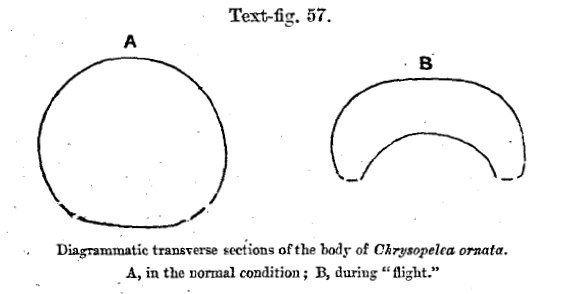 Figure from a 1906 paper describing the change in shape of the body of Chrysopelea. 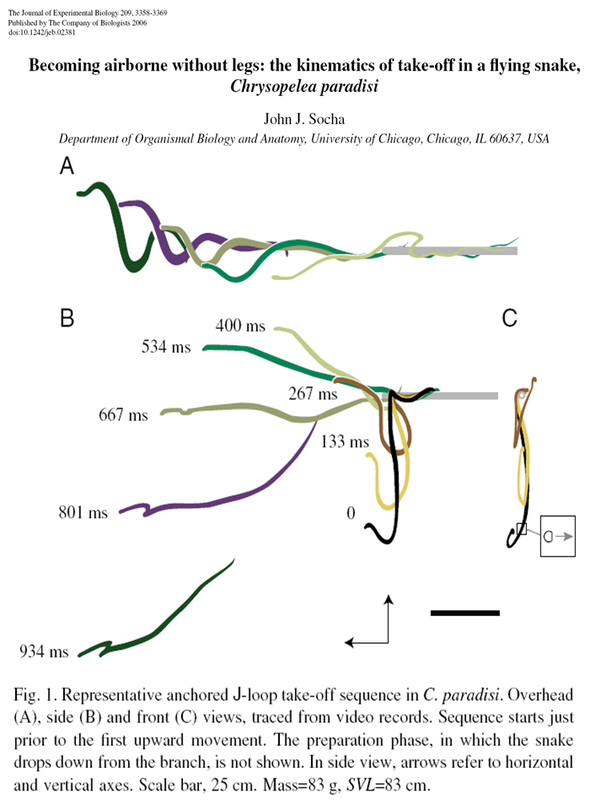 Finally, Socha and colleagues have investigated Chrysopelea's take-off behavior in great detail, using the same synchronized camera set-up they used to film the snakes in flight. 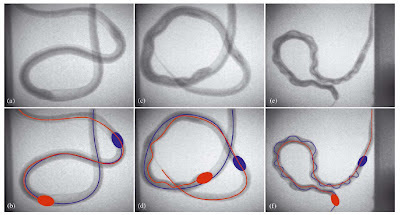 I won't go into excruciating detail (you can read the whole paper here), but you can get an idea of the movements involved by looking at the beautiful images produced below. 1 The author, Robert Shelford, was brought dead specimens of Chrysopelea in the late 1890s by Dyak villagers in inland Borneo, who told him that they were of a flying species. Skeptical, he obtained some live specimens and tested them by dropping them from heights of 15-20'; "after one or two false starts the snake was felt to glide from the experimenter's hands". Thanks to photographers Angi Nelson and Jake Socha. If you have more questions about Chrysopelea, check out Jake Socha's Chrysopelea FAQ. I've mentioned before how snakes can eat nearly anything, due to amazing adaptations of their head and jaws that allow them to swallow objects bigger than their heads. But surely they must be limited to eating prey that are shorter than they are in overall length, right? What about items that are just a bit longer? 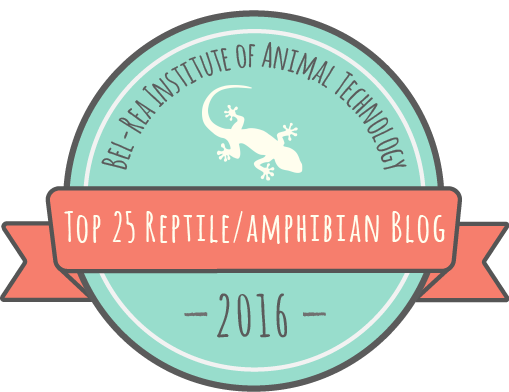 There are a wide variety of snakes that eat other elongate vertebrates, including other snakes, legless lizards, lizards with relatively small legs (like skinks), amphisbaenians, caecilians, and eels (today we'll focus on snakes, but look out for future articles on some of these other specialized diets). In many ways, this kind of diet is convenient for a snake, because they are already elongate, so they don't have to deform their stomachs, bodies, and mouths to the same extent as snakes that eat bulkier prey. 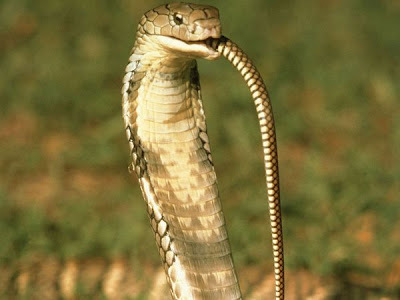 Many are relatively primitive snakes that retain the robust skulls of their lizard-like ancestors, but quite a few derived snakes are snake-eaters as well, including the King Cobra, Ophiophagus hannah, the world's largest venomous snake. 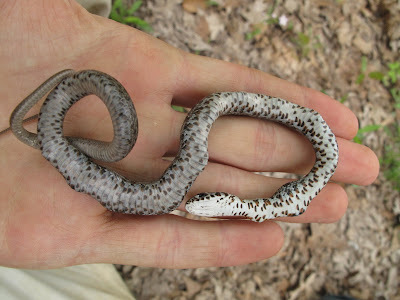 Other familiar snake-eaters include the North American Kingsnakes (genus Lampropeltis), which have evolved resistance to the venom of many species of viper. Eastern Indigo Snakes (Drymarchon couperi) and their Central and South American relatives are also frequent snake eaters, and many other species of North American colubrids sometimes dine on each other, including Racers (Coluber constrictor), Coachwhips (genus Masticophis, now sometimes included in the racer genus Coluber), Garter and Ribbon Snakes (genus Thamnophis), and Coral Snakes (genus Micrurus). Among their prey are many of North America's venomous snakes, including the Copperhead (Agkistrodon contortrix), Cottonmouth (or water mocassin, Agkistrodon piscivorus), and many species of rattlesnake (genera Crotalus and Sistrurus), as well as many non-venomous species of snake. 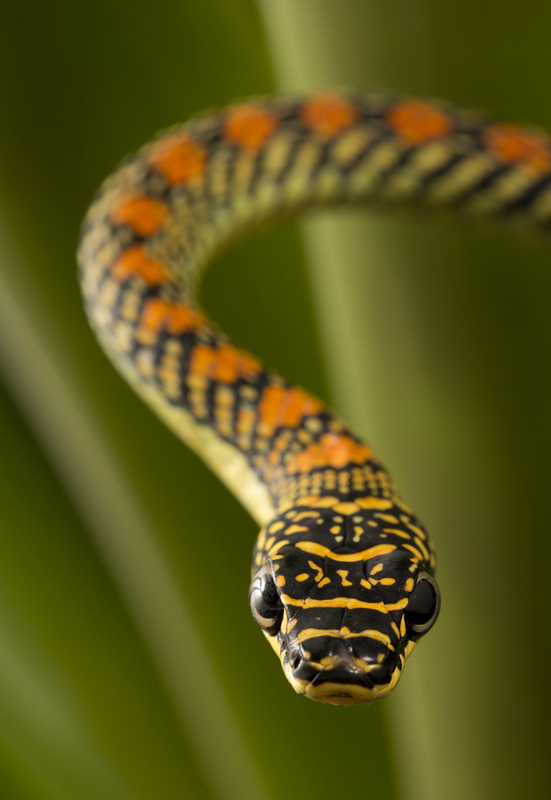 Because all snakes are predatory, the existence of snake-eating snakes implies that some snakes are feeding at a very high trophic level indeed, and indeed they may represent top predators in some ecosystems. Just how does a snake accomplish eating another? It is an arduous process, especially when the prey snake is as long as or longer than the predator. 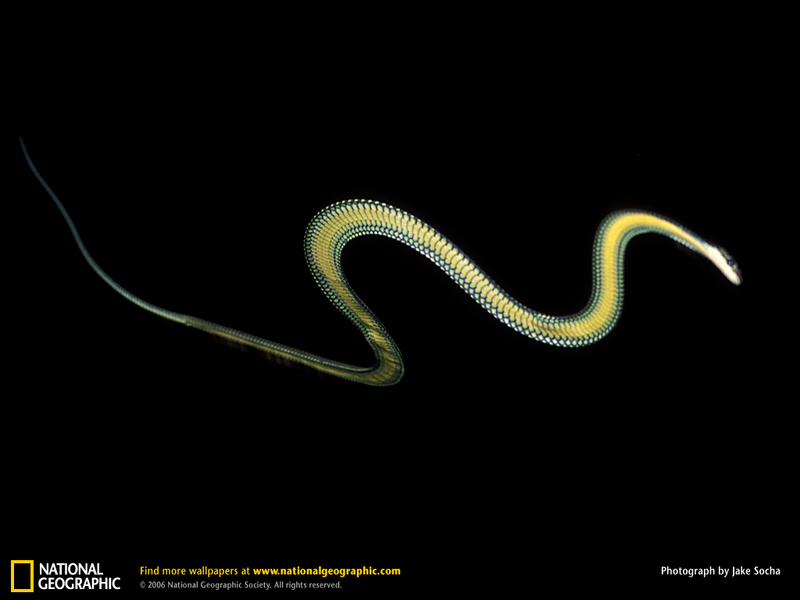 It's true: some snakes are able to ingest other snakes that equal or exceed their own body length. That means that these snakes must fit an object longer than their entire body into just their stomach, which (perhaps it goes without saying) is not as long as their whole body. The prey must be fit into the stomach, and cannot extend into the intestine or the esophagus, because the lining of the stomach is the only part of the digestive system that secretes digestive enzymes. Body width is not nearly as much as a problem - snakes have highly kinetic skulls and very strong and flexible trunk muscles, so they can both expand their body cavity and compress their prey in order to accommodate very wide meals. But there is a limit to the length of their gut - it cannot extend into their tail, which is solid with muscle, nor can the prey easily be left hanging out of the mouth, where it could impede the snake's movement, interfere with sensory processes, or begin to decompose. 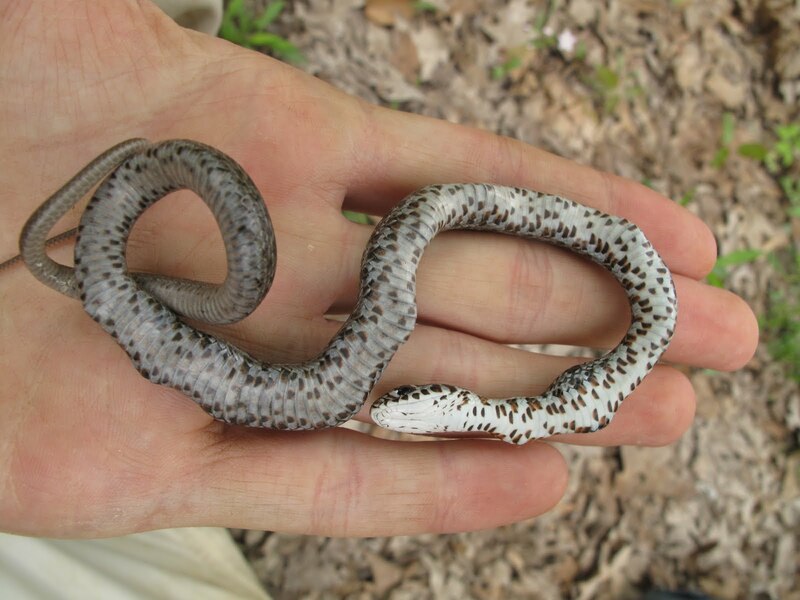 As determined in a paper by one of my favorite herpetologists, Kate Jackson, the author of the popular herpetological book Mean and Lowly Things, the solution hit upon by North American Kingsnakes seems to be to throw the prey into waves to decrease its length and pack it into the space available. They accomplish this by concertina-like motions of their own vertebral column, which causes the (dead) prey snake's body to conform in shape to that of its predator. The predator snake can then straighten out again while advancing its jaws, so that the standing waves were left in the body of the prey snake. 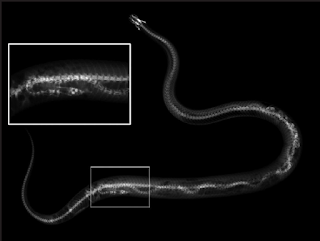 As you can see from the below X-ray images, taken from Jackson's paper with functional morphologists Nathan Kley and Elizabeth Brainerd, this allows the predator snake to pack pretty long snakes into its gut. It's the same principle as meandering your path increases the total distance you walk without affecting the straight-line distance from your starting point (in this case, the snake's mouth) to your finishing (here, the posterior end of the snake's stomach). 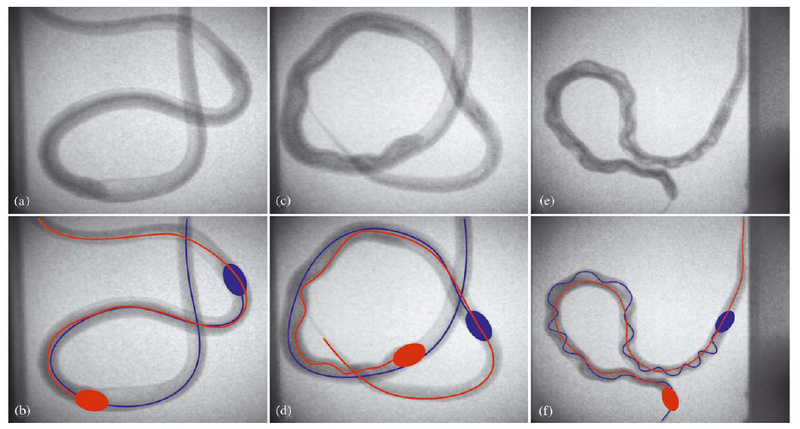 Kingsnakes tested in Jackson et al. 's paper were able to ingest Cornsnakes (Pantherophis guttatus) up to 139% of their body length and up to 135% of their pre-feeding body mass, which would be like a 6'0", 175 lb. person eating an 8'4", 236 lb. meal - in one bite. Without using their hands. As the prey snake is digested, a decrease in wavelength and increase in amplitude of the waves of the prey snake’s vertebral column takes place, because the prey snake's body becomes more compressible as its tissues are digested off. In Jackson's experiment, it took the Kingsnakes about 7-10 days to completely digest these huge meals (although a few of them regurgitated their prey after a couple days). As you can see, she was pretty much catatonic. The Ring-necked Snake she had eaten was 26.5 cm in length, and she herself measured only 28.9 cm, so her prey was >90% of her total length! You can really get an impression from this photo of the lumpy, kinked quality of the body of a snake that has recently eaten another, caused by the waves of the prey snake's body inside the gut of the predator. 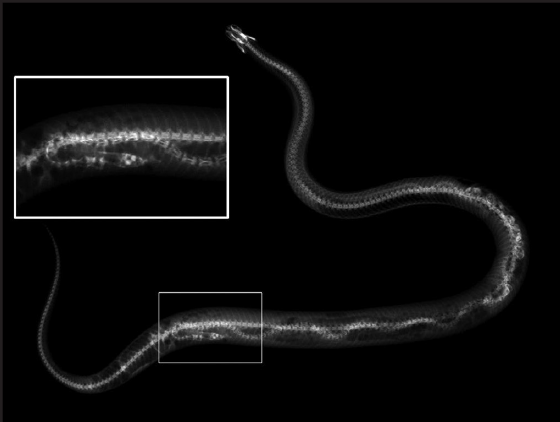 Edit: an observation published in 2015 showed that mudsnakes, which eat large, elongate prey such as sirens and amphiumas, also push their prey's vertebral columns into waves in order to fit them into their guts. Thanks to Belinda Wright for the photograph of the King Cobra. Geckos are some of the most diverse and widespread squamates on Earth. They range in size from the dwarf Sphaerodacylus of the Antilles (16-18 mm) to the (probably) extinct Kawekaweau or Delcourt's Giant Gecko, Hoplodactylus delcourti, of New Zealand (as long as a tuatara and as thick as a man's wrist). Except for a few species, none have eyelids, and most have adhesive pads on their toes that allow them to climb slick surfaces. Some are parthenogenic. A few owe their success partly to humans, and it is these that we consider here today. Several species of gecko have been introduced to the United States by humans, most accidentally, as stowaways or through the pet and greenhouse trade. 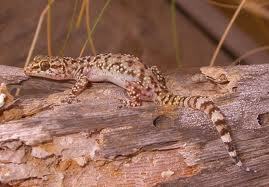 One of the most ubiquitous is the Mediterranean House Gecko, Hemidactylus turcicus. Described by Linnaeus in the first edition of his Systema Naturae, it is a yellow-tan, nocturnal, insectivorous gecko about six inches long. Whereas most of our non-native lizards are limited to a few small areas in Florida, H. turcicus can be found in 17 states, from California to Maryland. It isn't continuously distributed across the southern US, but rather locally common in urban sites, due to many separate introductions, the earliest of which occurred in Key West before 1915. One such population is in a middle school in Cary, North Carolina. Legend has it that a science teacher during the early 1980s was keeping some H. turcicus in a terrarium. All was well until an absentminded student left the lid off one day. The lizards escaped, and a small population has been living in the walls of the school campus ever since. At least, that's what everyone thought. An ongoing summer of research conducted by a wildlife student at North Carolina State University, my brother Kevin Durso, in 2012, has revealed that the population is much larger than anyone thought. On the first night, Kevin counted 82 geckos on the walls of the campus buildings. He came back with reinforcements - tall college students and volunteers armed with lizard nooses and water guns, for blasting geckos off ceilings and walls. On some nights, students at the middle school come out with their teachers and parents to see what the research is all about. Kevin & Co. are marking each gecko they capture with glow-in-the-dark elastomer, so they can be individually identified upon later capture. Once captures of new, unmarked geckos begin to decline, he can begin to estimate the total size of the population using a mathematical model. Whether this will happen sooner or later is still hard to know. Kevin is also keeping track of the exact location of each gecko sighting, so that a home range size estimate can be made. He works at night, when the geckos are most active. Perhaps this is why no one knew the true size of the gecko population until now - how often is anyone at school at night? Not if I can help it, Mom! 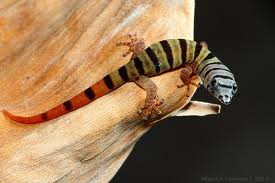 Previous research on house geckos has revealed that they inhabit similar areas, both climatically and in terms of microhabitat, in their native and non-native range. A population on the Stephen F. Austin State University campus in Nacogdoches, Texas, ate mostly grasshoppers, moths, and isopods. Their great success in southern North America has been attributed to low predation pressure, little interspecific competition, and a life history which maximizes survival at all ages. House geckos in southern Louisiana are host to native North American parasitic worms, so there is some potential for parasites to regulate populations of these non-native lizards. What factors have allowed the Cary H. turcicus population to grow so large? What effects do these non-native geckos have on the local ecosystem, from the arthropods they eat to the birds and snakes they are eaten by? Have they been spreading around the Triangle area since the 1980s, brought home on schoolbuses in students' backpacks and coats? Only time, and further research, will tell. The College of Natural Resources and the Office of Undergraduate Research at NC State University provided support and funding for this project. Thanks to Konrad Mebert, Miguel Landastoy, Alex Morrison, Kevin Durso, and Sandy Durso for photographs.